The MailChimp & LiveChat integration will help you expand your newsletter subscribers list at the push of a button. It allows your visitors to signup for your newsletters while filling out the pre-chat survey. No additional forms needed! All of that will let you reach out to a bigger number of users with your campaigns and gain more clients. MailChimp is a marketing automation platform that allows creating, sending, and analyzing emails and ad campaigns. It provides an array of pre-made templates and helps to automate your campaigns. For example, it lets you send messages with a discount if someone abandons a shopping cart on your e-commerce. Apart from the email features, the platform enables you to recapture the attention of people who leave your website - wherever they go online. It lets you serve ads on Google Display Network, Facebook Ads or Instagram. The great thing about MailChimp is that it enables you to set up the double opt-in. The double opt-in process requires users to opt-in to your mailing lists twice. First, they need to enter their email address into the sign-up form. Next, they receive an email with a confirmation link. It means that subscribers won’t receive any emails from you unless they confirm that they really want to join your list. This will help to keep the quality of your lists high. 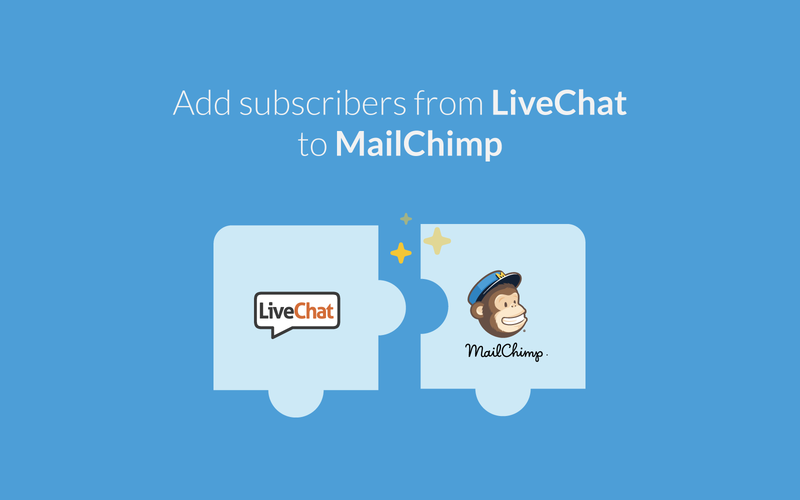 Integrate LiveChat with Mailchimp and expand your newsletter subscriber list. With just a few easy steps, your customers will be able to sign-up for your newsletter right in your pre-chat survey. All that is takes is their email address and a single click – it's that simple! The integration lets you store the information from the pre-chat surveys in your Mailchimp account, along with other contact information. With our native integration for MailChimp, you don't have to worry about a long and confusing configuration process. With just a few easy steps and our official tutorial, you can start growing your newsletter database in no time! Add a new contact in MailChimp when a LiveChat chat ends. It's a perfect way to gain new subscribers and extend your email campaigns reach. The competitive advantage can be obtained by managing your products more effectively and having good relationships with customers. With LiveChat, you can communicate with your customers via a channel they prefer while providing a superior customer experience. The LiveChat & MailChimp integration allows you not only to talk with customers while they're browsing your site but also helps to gain new subscribers from live chats. Start using LiveChat with MailChimp now!